Grain Amaranth is a South American crop the seeds of which are eaten popped as a cereal or cooked like cous cous. The leaves of this variety are also edible and highly nutritious. Takes 12-13 weeks from sowing to harvest. Each packet contains approximately 500 seeds. Grain Amaranth is native to the highlands of South America and was a staple food source for Native American civilizations in the region prior to the Spanish invasion. Grain Amaranth is an annual which produces large, feathery plumes, each made up of masses of small, deep red flowers. The flowers fade to a golden yellow as they age and each flower bears a single Amaranth seed. The seeds and leaves can both be eaten and are highly nutritious. Grows to about 1.5m tall but can grow large under ideal conditions. Collect flower plumes once they begin to shed their seeds and dry for a week in a large container or on a tarp. Once dry, rub the flower plumes so that the seeds are released and winnow (pour from one container into another) in a light breeze and the breeze will remove any flower debris from the seed. Amaranth seed is used like a grain and is similar to cous cous when cooked, although because the Amaranth plant isn't a grass the seed is called a pseudograin. The seeds can also be popped and eaten as a snack or like a cereal with milk. The seeds have more protein than corn, rice and wheat. Despite being a grain variety, the leaves of this variety can also be eaten raw or cooked and make a good quality spinach substitute. Similarly to the seed, the leaves are also high in protein and are very nutritious. To sow, scatter over the top of the soil and rake in lightly. As the seeds will be close to the surface they will require regular watering until established to prevent them from drying out. In the subtropics and tropics Grain Amaranth can be sown all year round. In temperate regions sow from November to February. Make sure the any chance of frost has past prior to sowing. Germinates best when soil temperature is between 20 and 27 degrees Celsius. 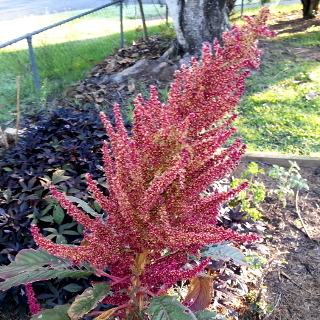 Amaranth plants are naturally pest and disease resistant, and tolerate both drought and high temperatures. Takes 12-13 weeks from sowing to harvest.